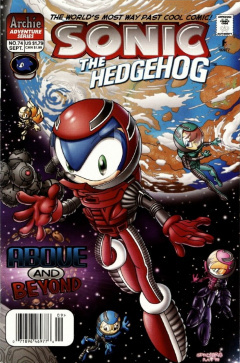 Sonic the Hedgehog 74 is the seventy-fourth issue of the Sonic the Hedgehog comic. This comic features two stories, the first story, titled "Don't Call It A Comeback!" and the secondary story, titled "Tales of The Great War Part Three: Enter... Robotnik". Of note is that the second story takes place in-continuity before the first. In the throne room of Castle Acorn, a tearful Sonic reveals that Knothole is gone. King Max demands Sonic explain himself, and Sonic elaborates, stating that all the Robians have disappeared from Knothole Village. Sally, Elias, Nate Morgan, Bunnie, Tails, Antoine and Amy all look upon him shocked. Sonic blames the satellites around Mobius for their disappearances. King Max orders Sonic to remain calm, but Sonic snaps that he can't do that and storms out of the castle in anger. Sally runs after him and asks him to listen to her father, but Sonic tells her that he refuses to listen to him this time, and maybe ever again. Sonic stands at the outskirts of Mobotropolis, trying to figure a way to get to space to investigate the satellites. He is soon joined by his friends, and Nate shows them a small space shuttle that he and Rotor had recently found and repaired. It can fly with the aid of Power Rings as a power source, but warns that they may not be enough to make the whole journey. Sonic whistles, summoning Dulcy to help. Sonic tells Amy to stay behind with Nate. He begins to tell Sally to stay behind with her father, but Sally refuses. Nate stays behind with Amy as Dulcy lifts the space shuttle into the atmosphere. The Freedom Fighters, wearing spacesuits, exit the shuttle and head inside the eighth satellite. Sonic makes a sudden realization that he forgot to thank Nate for all his help, recognizing that in helping, the elderly Overlander may draw the ire of The King. Sally comforts him, saying that Nate told her that, in the brief time he's known them, Sonic has proven himself a hero, and that if anybody could stop the satellites, it's him. Sonic is flattered, just as they float upon a junk trail left over by the satellites. They see the satellites, now locked together as one giant orbital platform. They sneak in through the waste disposal chute and make it aboard. They take off their helmets after Nicole tells them the satellite has artificial gravity and an abundance of breathable oxygen. Before they fully gain their bearings, the group is suddenly surrounded by a number of strange SWATbots, but easily destroys them. Then they get surrounded by even bigger SWATbots. Doctor Robotnik then reveals himself to the group, proclaiming these bigger models as Shadow-Bots, his personal vanguard. Sonic, absolutely shocked that Robotnik is apparently alive, demands to know where his parents and all the other roboticized Mobians are located. While watching Dulcy lift the space shuttle up to the sky, Amy can't believe that Uncle Chuck has gone missing. She remembers when they were in the library with him, just the previous day. Uncle Chuck revealed to Tails, Amy ,and Jeremiah, that he and Jules rescued Dr. Robotnik (then known as Julian Kintobor) before the Great War, confessing, to the group's shock, that had he known then what he knows now about Robotnik, he would still save the man. Uncle Chuck considers all life sacred, that, just because an enemy lacks character, is not excuse enough for him to do stoop to their level. Despite the protests of General D'Coolette, King Max accepted Julian into their kingdom, reasoning he refused to make the same mistake he made with Nate Morgan again. Kodos and Julian soon met in secret, discussing that they should become a team and take the kingdom for themselves. Kodos revealed his private weaponry and a portal to the Zone of Silence, only to be ambushed with a blow to the head and thrown into the Zone by Julian. Julian tells King Max about Kodos' disappearance, neglecting to tell him that he was responsible, and convinced Max to wage war with the Overlanders. Max trusts his advisor, and vows to fight on, to victory.